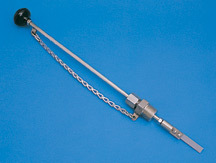 Metal Samples offers a large variety of coupon holders to fit most standard applications. 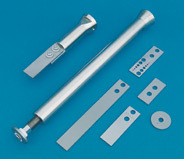 Additionally, we can design and manufacture custom holders to meet special requirements. Please contact your Metal Samples sales representative if you do not see what you are looking for. Pipe plug coupon holders are the most common and most economical type. They are simple to install, and can be made from a variety of materials. These coupon holders are typically used with bypass systems, but can also be threaded directly into process piping. Select Pipe Plug Coupon Holders for Flat/Strip Coupons, or for Cylindrical Coupons for more information and ordering details. 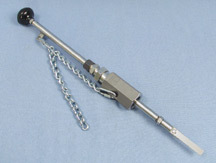 Low Pressure or Hand Insertable systems can be used for pressures up to 125 psi. This assembly is commonly used in the water treating industry for coupon insertion through a full port valve. An example of this is in a municipal water pumping station, where leakage during withdrawal of the test coupon would not be critical. See the SR3000 for more information and ordering details. 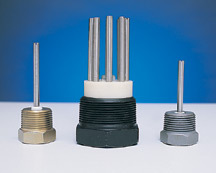 Packing Gland systems are used in environments where ratings up to 2,000 psi are required and leakage is prohibited. These systems do not require line (process) shutdown to insert or withdraw coupons. The assembly is used for coupon insertion through at least a 1" full port valve. A safety cable is provided to prevent accidental discharge. See the RT4000 for more information and ordering details. These coupon holders are used with High Pressure Access Systems (HP™ or MH™) where pressure ratings up to 3,600 psi are required. HC Series Coupon Holders - for use with HP™ or MH™ High Pressure Access Systems. 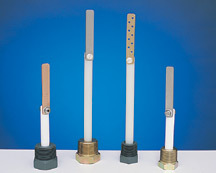 Hydraulic Series Coupon Holders - for use with Hydraulic High Pressure Access Systems. 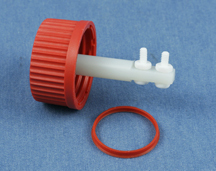 Used with "Schott" lab bottles with a DIN GL 45 thread. Holds two (2) standard CO118 style coupons.